Thus once the data base has been created for all the items in the above manner the first part of ERP is ready for further programming. Once the data entry is completed suitable software programme can be incorporated to generate the following information in respect of each item/ store (item). If more information other than the below is required it can be incorporated. Remember this is only in respect of the items which are procured and its accounted. The data should appear something like the following on the Monitor screen. The ERP expert will work out suitable model based on the requirement to be generated. In addition to the information per item as stated above, data may be required in the following manner for few or all the items for administrative and analysis purposes. Similar Index with required data will be prepared and used to get the following data. 2. Entire Supply orders with due dates of supply. 15. 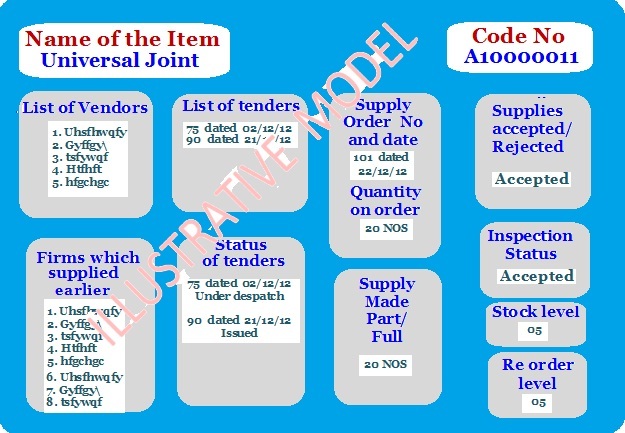 As on date which are the items that have reached the order level. It is not an easy task for the ERP consultant to re module the programme if readily available. However they can work out a tailor made program and give you once the requirements are clearly defined and given. What has been suggested above are all illustrative model to guide the organization and it is for the individual user Organization to work out their requirement after getting the Organizational structure and working well studied by some experienced person. But once done the working will be a very smooth affair and with a click of button the entire data will be available at a single point source and help the organization cut down wasteful expenditures. In order to get the above data enter only the Code of the item to get the required information. What inputs will be required to be fed in the data bank to get the formation as above and how will they be linked ?